Railpictures.ca - Dave Burroughs Photo: When was the last time you saw a pair of RS-3′s on the transfer from Buffalo to Fort Erie? For me, it was in Sept 1968 just west of the Central Avenue bridge which has been replaced with a concrete structure. I am looking at the autos and think they might be 1969 Mercury Marquis Broughams. There is also a fallen flag on the Erie box car. | Railpictures.ca – Canadian Railway Photography – photographie ferroviaire Canadienne. 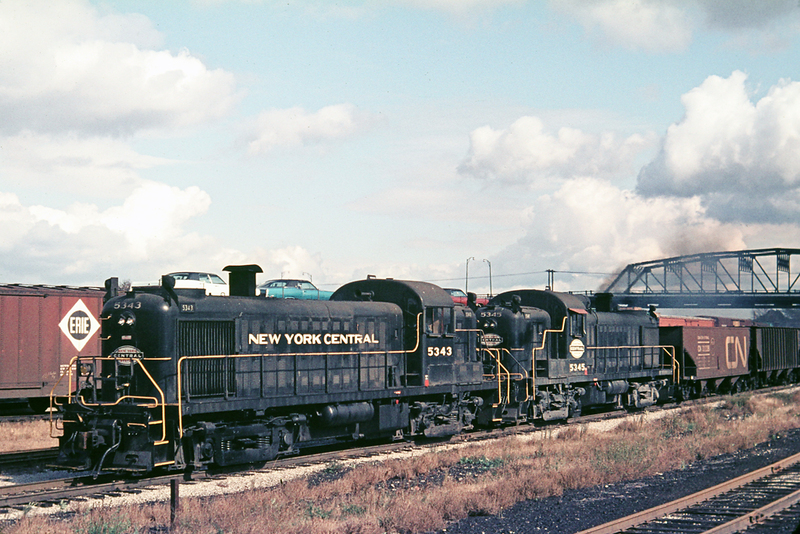 Caption: When was the last time you saw a pair of RS-3's on the transfer from Buffalo to Fort Erie? For me, it was in Sept 1968 just west of the Central Avenue bridge which has been replaced with a concrete structure. I am looking at the autos and think they might be 1969 Mercury Marquis Broughams. There is also a fallen flag on the Erie box car. Nice one Dave, RS3 along with RS1′s and RSD5′s were all around the Niagara area at this point. This guy is obviously bringing back some empty Dane ore hoppers ( the ribbed one is more than likely a CASO), so that train 450 or perhaps 468 will take them to Toronto and etc. Don’t think I ever saw PC’s, only the NS units in more recent years. For me in Fort Erie it was a pair of Penn Centrals in mid 1976. Rare stuff. Great shot.